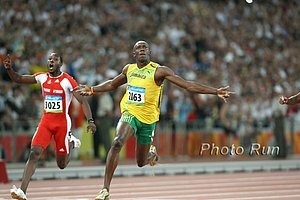 "A Premier Race It Leads. For Our Own Lovely Sport that means having the best Americans in the race. 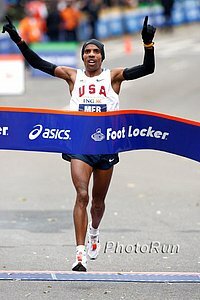 We are proud to announce Meb Keflezighi is in our 2011 Boston Marathon field." - John Hancock President Jim Boyle announcing yesterday that American star Meb Keflezighi would be running this year's Boston Marathon against defending champ Robert Cheruiyot, 2010-2011 sensation Geoffery Mutai, and fellow American star Ryan Hall. Alan WEBB is NOT leaving Salazar...it is an April Fools Joke. LRC Meb Is Running Boston, Alan Webb Is Not It was a stunning 24 hours for the Boston Marathon. They were on the brink of signing American mile sensation Alan Webb to run this year's Boston Marathon when Webb dumped marathon star Alberto Salazar as coach. 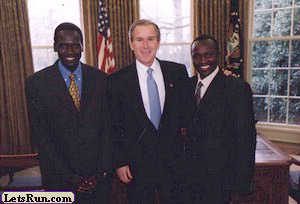 Boston then got cold feet on Webb and signed Meb, a guy who has actually done tremendously well nearly every time he has toed the line in the marathon. LRC It's Official: Tegenkamp Moving Up To 10,000m Despite finishing fourth in the world at 5,000m once and making the last 3 World Championships finals, Matt Tegenkamp has concluded he's not very good at 5,000m and, like everyone else, is moving up in distance. Third Brojo Found More info Here and Here. Until last year, he was Mojo. Now he is called Menjo. Employee #1 Joins Record Number Of Unemployed The first-ever LetsRun employee was let go for two many typos on the front page. LRC LetsRun.com's Rojo Arrested After Breach Of Professional Decorum At Fairfax, VA Eatery We cannot publish too much on this story due to the legal case now pending. 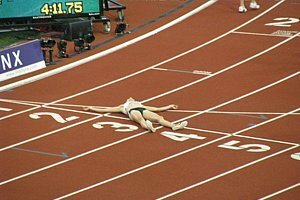 The main points are LetsRun.com's Rojo, upon hearing Alan Webb was looking for a new coach, got in touch with Chris Lear (who was also Rojo's college roommate), the author of Alan Webb biography Sub 4. Lear set up a clandestine meeting between Rojo and Webb at a dining establishment called Five Guys. After Webb shot down Rojo's coaching entreaties, Rojo basically lost it and had a tantrum breach of professional decorum. More details here, including what Webb ordered for dinner.